The new Lithium Jump starters are available in two variants, a 950A 12V (LS950) unit and a more powerful 1250A (LS1250) 12V variant with both featuring high rate discharge Lithium Iron Phosphate (LIFePO₄) batteries, providing maximum protection, safety and reliability. Other benefits include a long storage life without needing recharging, this makes them ideal for use in emergencies and also means the units can be stored in a vehicle with the knowledge that they will be ready to go if the need arises. Operating at 12V also ensures that the Jump Starters are suitable for a majority of motorcycle, passenger car, four wheel drive and light commercial vehicles along with marine batteries. The LS950 boasts 950A peak amps and 290A clamp power, providing enough power to start diesel engines up to 3.2 litres and petrol power plants up to 6.0 litres. The larger LS1250 with its 1250A peak amps and 400A clamp power takes this performance to a higher level, easily starting diesel engines with up to 4.5 litres displacement and petrol engines up to 7.0 litres. As well as being jump starters, both the LS950 and LS1250 can also be used as power banks, allowing the owner to charge mobile phones, tablets and other portable devices such as sat.nav systems via both units’ 2.1 and 1.0 Amp USB Ports. Recharging the Jump Starters themselves is easy via 240V and 12V cigarette lighter plug chargers. Both models include a durable, padded carry bag for easy transportation and protection when not in use. 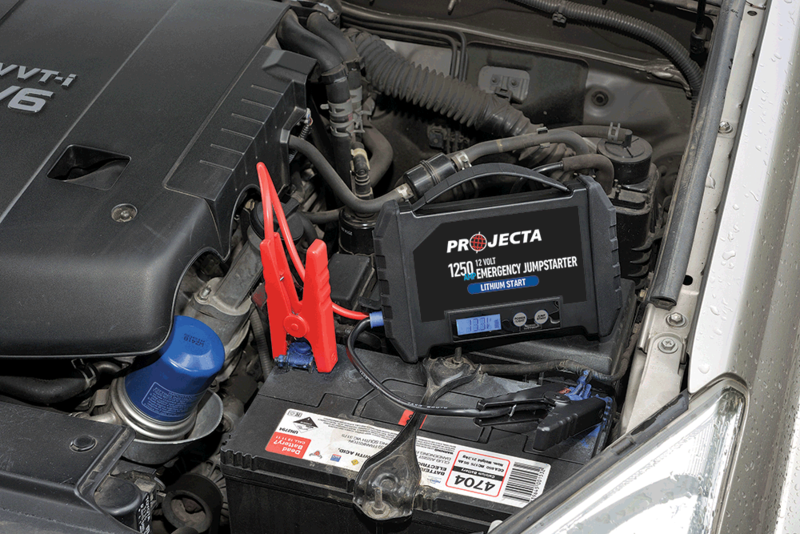 Projecta’s new 12V LS950 and LS1250 Emergency Lithium Iron Jump Starters can be purchased at all leading automotive, transport and four wheel drive outlets throughout Australia at approximately $ 290.00 for the LS950 and $395.00 for the LS1250 model.